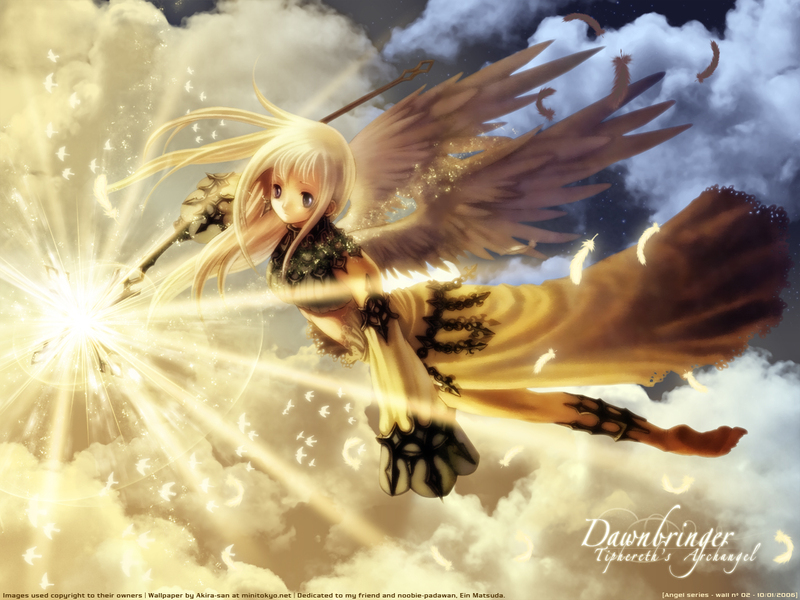 It's my second wallie from my angel series, the Dawnbringer - Thipereth's Archangel. Tiphereth's Archangel cause it came from Hikaru Mizusawa's doujin named Tiphereth and cause it looks an archangel. I got the scan from Lunaregina, she sent it to me for my angel series, I tried to recreate the scan's scenery with a gold sky with the night going off. The lightning effects was the funny part, I really enjoyed to make then to show she's bringing the dawn and the light. End of description (finally) plugs and stuff will come later with an edit. Wow, this is very cool :) Great background to match the scan. gorgeous! only that one word to describe it! Oh wow! This is simply beautiful! It looks so heavenly! Wonderful work! Really great! One of best work I've seen! Keep up the work! Wow very beautiful wall. I like your effecrt and bg color (carecter cute ^ ^) . Thank for sharing. DamN~ I love it.. Seems to blend in nicely! WOW! Nice wall! It look very angelic. I really like the cloud. i love the cool scan! love the art! XD + those clouds are nice too! the color combo of white and black is a great combos! the effects really fit the whole scan! XD +fav! uhmm ~ overall the wall looks cool ~ *-* nice chosen scan n extraction . I know the clouds in the left part r yellow bcoz of the light , but it looks a bit odd that its too dark on the right part .. I mean it doesnt go too well .. I like the font , very suitable for magical-looking walls X) but .. I dont like the birds .. *3* there r too many n doesnt have enough perspective . Wow.. you did an awesome job on the clouds. That looks fantastic! And the colors are beautiful! Unbelieveble .... it looks fantastic. The angel looks like it's bringing darkness instead of light though, looking at the dark skies behind it.